Returning home after work today and having my house smell like heaven was quite a little treat! I like cooking on my weekend evenings, but Friday nights are sometimes a struggle. I want home-cooked food, but I’ve been at work all day and have most likely forgotten to even defrost anything, let alone prepare something awesome for dinner. 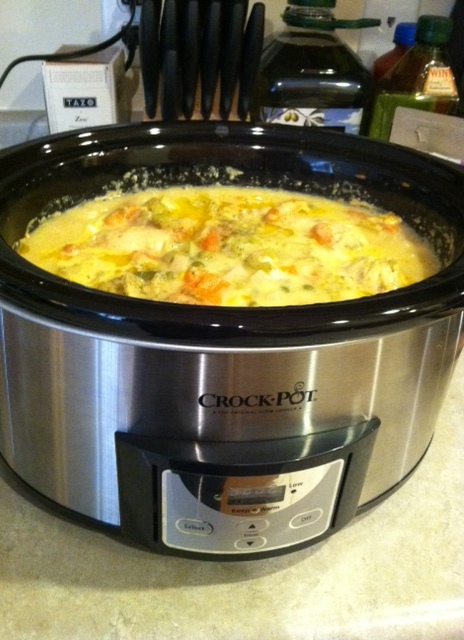 This is where my handy-dandy Crock Pot comes into play! During my lunch hour at home today, I threw together our dinner in about 5 minutes. It may be hot outside still, but this dish is all about warmth and yummy comfort food. My fave! Turn your Crock Pot onto high. 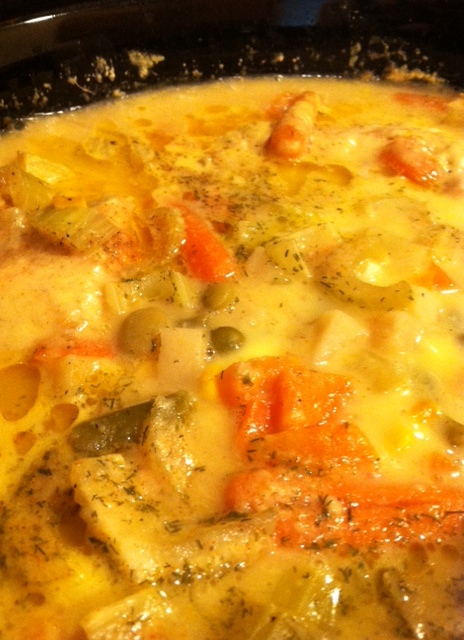 Place the chicken breasts into the bottom of the crock. In a separate bowl, mix up all the other ingredients, except for the rice, to create a chunky, creamy sauce. Pour this over the chicken in the crock. Cover and leave to cook on high 4-6 hours. The chicken will become more tender the longer you let it cook! When I got home from work today, I shredded up the tender chicken with 2 forks and stirred in the brown rice. Note: Use 1/2 cup more rice if you would like a thicker consistency. Recover the crock, leave it on high, and let it cook for about 1 more hour. Once the rice is nice and soft (and has soaked up a lot of the liquid), dinner is ready to be served! This recipe came out to the consistency of a thick and hearty stew. Nick immediately said it reminded him of chicken pot pie. He was right! 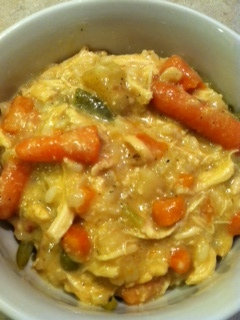 It is exactly like chicken pot pie without the crust. It was delicious and filling. We both had to have seconds tonight! Since my lunch was completely carb filled (you’ll see below! ), I opted to eat mine with extra veggies – green beans to be exact. Nick would rather have his chest hair plucked than eat green beans, so he just ate his on it’s own. He completely loved it! I think this will definitely be a go-to recipe for this Fall and Winter. 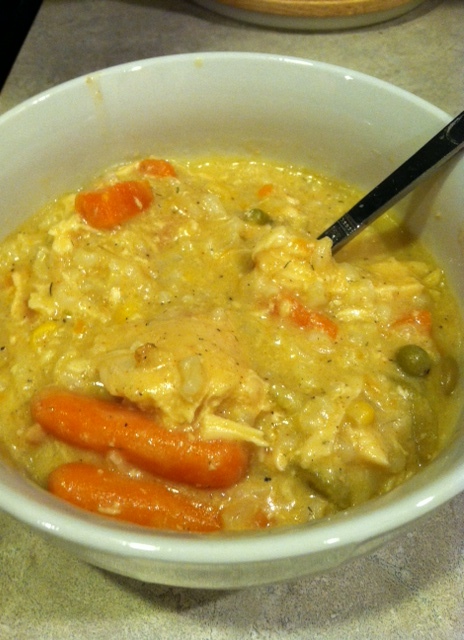 It was a bowl full of comfort food at its best! And even better, we have enough leftovers for a few more bowlfuls. Yay for quick and easy leftover meals! Backing up a bit…Lunch was rushed and all over the place since I was trying to decide what dinner would be tonight and walk Mac at the same time. I was STARVING when I walked in the door, so I won’t lie…I definitely overate at lunch today! 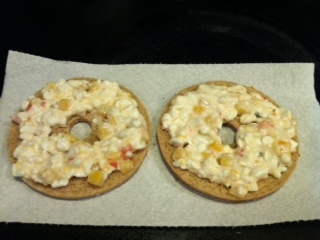 I started with a Whole wheat Bagelthin topped in a mixture of cottage cheese and mango salsa. This mixture is completely savory and delicious! Luckily, I think I was in need of the nourishment. Usually this meal would’ve left me sick and feeling tooooo full. But I felt like I had barely eaten anything by the time I arrived back at work today. Just call me the real life Bottomless Pit! So it’s been a food-filled Friday! Hope it’s been a good one for you all. Tomorrow will hopefully start out with a good run and then I’m teaching a 10 AM Jazzercise class. Have a great night! That looks good. I just love a reason to use my crockpot. I’m making this now but was questioning whether or not it needs water or some other liquid? Does it have to be instant rice? I’ve only ever used the instant rice, but I could guess that using regular rice would be okay too. You may need to put it in the crockpot sooner though so it has enough time to get fully cooked. The instant rice only needed an hour to cook in the crock. You might try adding the regular rice 2-3 hours before you are planning on serving the meal. Good luck! Could you use regular brown rice at the start of cooking process? I found your recipe on Pinterest and thought I’d try it. I went to get cream of chicken soup out of my cupboard and discovered I only had cream of mushroom. I have another recipe where I trade these for each other so thought, what the heck. It was close to done and we have been running around today. I was impatient about waiting for the rice and am not a big fan anyway. I decided to dump preseasoned stuffing in. Oh- my- goodness. Yep, always getting made this way. Thanks for the starting point! Stuffing! I looooove stuffing! I am making this for the second time (mu husband loves it!) and I think for the next time I’ll put stuffing in there. That sounds SO good!!! Pre-seasoned stuffing mix, what a great idea! My family love stuffing, and I never think to make it (didn’t grow up with it)! Too bad I already started the rice! Oh well, next time. Thanks for the idea. did you just put dry stuffing in or did you follow the directions on stove top? sounds like a good meal. How much egg noodles did you use? Uncooked egg noodles? Thanks! I don’t have instant rice. No, that is false, you can look it up on Snopes. Not true. Baby carrots are made from regular carrots and shaved down in size because they sell better for their handy size. ALL carrots start to get white marks on them after awhile as they dry out and dehydrate. Peel a large carrot and leave it in the fridge; white marks! Happens to carrots right out of my garden. There is a difference between baby carrots, which are carrots harvested earlier resulting in that extra sweetness, and baby CUT carrots which are regular carrots cut to look like baby carrots. As for them being washed in bleach or chlorine, some companies do wash ALL carrots in chlorine, however that is not what causes that white coloring. Regular peeled carrots straight out of your own garden will do the same thing. Regular Carrots have such a better flavor than baby carrots I have found. Just takes a few seconds to peel regular carrots and much much better taster for me anyway!! My family loves my turkey pot pie. Nowadays, I want to reduce unnecessary calories. This recipe for crustless pot pie is great! Think I’ll use turkey instead of chicken. More flavor. My slow cooker/pressure cooker only has a low setting, so I am guessing I will just need to cook it longer. Just started cooking. Thank you!!!!! I was looking for this! How many serving did you put in Myfitnesspal? Can I put potatoes in? Kathy, I do not but a previous commenter mentioned she put it on MyFitnessPal and named it Becca Boo’s Chicken and Rice if you want to look it up! I never comment on anything, but I found this on Pinterest and it is perfect! I used frozen peas instead of celery because I didn’t have any, soo yummy! Thanks! I made this last night and the entire family loved it! The seasoning was perfect. We ate it with biscuits on the side. Thank you! do you think I would get the same flavor if I cooked the rice and then added it? Looking to save a little time. The only rice I have is boil in a bag..is that the same as instant? Sure! You will get the same flavor but the recipe may need less liquid if you aren’t cooking the instant rice in the chicken mixture. I believe boil in a bag rice is a bit different than instant (needs to cook longer). Don’t worry too much, this won’t make or break your meal! Do you think this recipe as is would be enough for four adults(two of them eat a lot) and one child? Hmm, I’m guessing it would. Especially if you served it with some biscuits or something extra! Good luck! Tried this for the first time. I have tried a lot of recipes on Pinterest and most of them have been very good but I usually don’t comment. This recipe deserves a comment as it was excellent and soooo good. I did make a couple of changes. I only added 1 cup of water as I microwaved my instant brown rice and then added it near the end. I did not use celery as I was skeptical it may get too mushy after 6 to 8 hours of cooking. But I did use sweet peas instead and it was wonderful. Did you use frozen green peas instead of celery? And when did you add them in. Flavor was excellent… But the consistency of the finished product took me by surprise. My husband referred to it as “sturdy chicken noodle soup.” I used 5 breasts and thought it was overloaded with chicken (not that that’s necessarily bad!) and there was barely any rice. In the future, I’ll definitely use two cups of rice instead of just one – and I’ll probably serve it with crusty bread or something to give it a little crunch. I pinned this on Pintrest some time ago and just haven’t got around to dragging out the crock pot and giving it a good cleaning. That is done now and I just put this together for supper tonight! I can’t wait to see how it turns out, it sounds so delicious! Do you use grated or shredded parmesan cheese in the recipe? would it be weird to add frozen broccoli to this? The chicken breasts – is it boneless, skinless or regular chicken breasts? did you use grated or parmesan cheese? I’m making this recipe right now.. Only I am using cream of celery because it’s all I had.. And putting in a bag of organic mixed vegetable instead for my veggies!! Im anxious too see how this turns out!!! Thanks for the recipe!! Which kind of Parmesan cheese do you use? The grated kind or the powdery kind you shake out of a can? could you use regular white rice and when would you put that into the crock pot? How about the water amount if using regular rice? If you wanted to cook this on low, how long do you think it would take with the frozen chicken? What size is your crock pot? I only have a 4 quart. Will it hold all this? It looks so delish! I want to make it on Easter. I could not find “Becca Boo’s Chicken and Rice” on My Fitness Pal. I came up with 5 servings at 280 calories each. I’m not sure where the 113 calories per cup came from. My servings may be more than a cup and I used white rice but including the veggies. House smells so good. Cannot wait to eat. Made a few changes to suit family preferences. Substituted boneless, skinless chicken thighs for chicken breasts. My family does not generally care for celery so substituted celery salt for garlic salt. Also I don’t use instant rice and have decided to make a pot of rice and serve the chicken and gravy over it. Okay, I followed the directions and it is SO watery! I was going to use noodles, but seems like it might be more like soup? Help! Hello Justine.In a pinch if that was to happen to me. I probably would add a bit of corn starch mixture ((just cold water and corn starch mixed together, cold water makes no lumps in this!)) and add that to make it thicker. Not too much maybe like 2 tablespoons to 1/3 cup cold water or a bit less water. It does help. My family loves stew of any kind when I thicken it this way! Good Luck!! Just had a party and I have some chicken breast left. Instead of using the crock pot ima use your recipe in a stove top pot. Thanks for a quick recipe that ima use for my left over chicken breast. Ima also use egg noodles instead of rice. This looks delicious, I’m going to make it for camping this weekend! I like love the idea of cottage cheese with the mango salsa. Not a big fan of cottage but with the salsa, oh yea! Is bagged uncle ben’s ready rice the same as instant rice? Thoughts on cooking it on low instead of high? How long do you think if it’s on low? I love this recipe. The only change I made was using chicken stock instead of water. I liked the flavor better. And I also used minute rice. I put it in uncooked and in about 20 minutes its ready. Everyone in my family loved this! The combination of spices worked out well. Great taste. I did use 1 can of cream of chicken and 1 can of cream of mushroom because that’s what I had. Instead of celery, I added canned green beans at the end. Also, I only used 1 cup water because I didn’t add the rice to the crick pot, instead we put the creamy chicken over rice on our plates. Very good served with a crusty bread! I added bag of frozen mixed vegetables. I just made this and added more of my favorite veggies, it made my house smell amazing!!! Thank you for sharing! ❤❤ the family and friends we invited over loved it! At what point did you add extra veggies..thinking of adding frozen spinach? Also, instead of instant brown rice I want to add boxed rie pilaf. Would that work out okay?